In this latest article in our series on the fauna and flora of New England, ONE takes a look at the Beaver. Views on beavers tend to fall into two distinct camps; those that see them as gentle, affable creatures, and those that see the rodents as pests. The truth, as is often the case, lies somewhere in between, but there is no doubt that beavers play an essential part in the health of the New England ecosystem. The beaver is incredibly adaptable with fossil records indicating that they have lived in North America for over 6 million years. To put that in perspective, the earliest humans ventured into New England approximately 10,000 years ago as the glaciers retreated at the end of the last ice age. Early man hunted beavers for their pelts and food, but the indigenous population appreciated the beaver played an important function in maintaining the wetlands and the two species coexisted happily. Some tribes referred to them as the “sacred center” of the land as they created a rich, watery habitat for fish, turtles, frogs, birds, ducks and other mammals. When Europeans arrived, the beavers came under ever increasing threat, as their pelts were highly prized by the colonists for coats and fur hats. Beaver pelts became common currency between New England tribes and the newcomers. However nothing could be further from the truth. Astonishingly, beaver ponds equal both rainforests and coral reefs in the biodiversity they support. Many species evolved over countless millennia to take advantage of this unique habitat, and rely either in whole or in part on this environment for their survival. Consequently, beavers are one of nature’s “Keystone” species. Today, nearly half of North America’s endangered and threatened species relying on these wetlands. 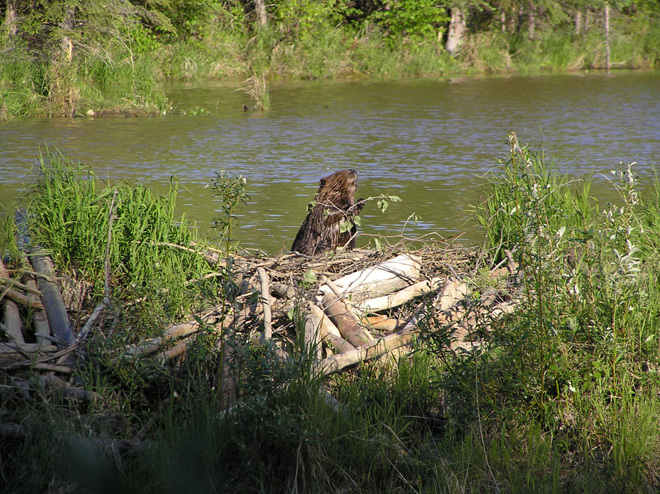 Beavers create dams by chewing and felling trees which isn’t as devastating as it might first appear, instead being part of the natural cycle of renewal. The felled trees open up heavily forested area and beaver pruning stimulates willows, cottonwood and aspen to strong fresh growth. After eating the tree bark and cambium, the soft tissue underneath the bark, beavers use the peeled sticks to build a dam (and lodges in which they live). 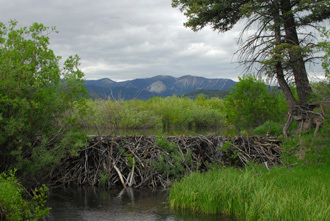 As beavers prefer to dam streams in shallow valleys, the flooded area quickly becomes productive wetlands. The wetlands absorb floodwaters, alleviate droughts and floods (as the dams keep water on land longer), reduce erosion, raise the water table and even purify water. Purification occurs as several feet of silt collect upstream of older beaver dams. Toxins, such as pesticides, are broken down by microbes in the silt resulting in cleaner water downstream. When beavers abandon their lodges and dams, aquatic plants take over the pond. In time, shrubs and other plants grow, and the area becomes a meadow. The shrubs provide sufficient shade to allow tree seedlings to thrive and the land, once again, becomes wooded. In the thirties, beavers were reintroduced into Massachusetts as their importance to the environment was recognized by biologists. Thirty years later many states introduced wetland protection laws to protect this environmental treasure. 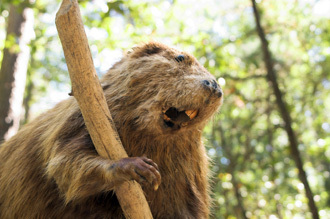 As beaver populations rose, so did conflict with man. Initially the beavers were simply trapped and relocated or killed, and the wetlands drained. This proved to be only a temporary solution as new beavers moved in and the cycle started afresh. Today, advances in technology and flow design are increasingly allowing beavers and their human neighbors to coexist in harmony. 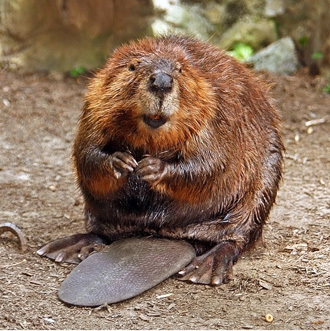 Adult beavers vary in size from between forty to seventy pounds. 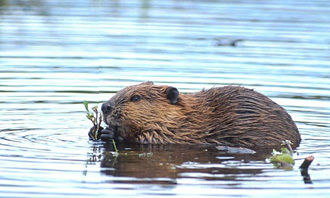 Covered with dark brown fur on its back and sides with lighter further on its chest and belly, short front legs with heavy claws, longer rear legs, webbed hind feet, and a large, flat, tail, a beaver is easy to identify. The beaver waterproofs its thick fur by coating it with castoreum, an oily secretion from its scent glands. It has a thick insulating layer of fat under its skin and has long sharp upper and lower incisor teeth that grow throughout the beaver’s life. The tail is used to maintain balance when it is gnawing on trees, and is slapped against the water to signal danger or to warn away predators. When the beaver is underwater, its nose and ears close up, and a special membrane covers its eyes. Beavers mate for life during their third year and procreate between January and March in New England, with the kits being born three months later. 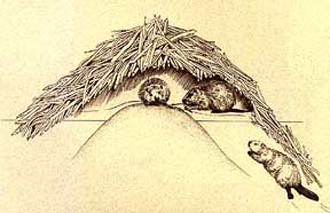 Before birth, the female makes a soft bed in the lodge and on average, litters comprise two to four kits. The babies’ eyes are open when they are born, and they can swim within twenty-four hours of birth and will be exploring outside the lodge with their parents within a few days. The offspring remain with their parents for two years, with the yearlings assisting with the new litter. The beavers cover their lodges every autumn with fresh mud, which freezes when the temperature drops. The hardened mud protects the beavers from their predators such as wolves and coyotes. The lodges are typically surrounded by a protective moat and have a single internal chamber above the water line which is lined with dry plant material. A vent leads to the surface to provide fresh air. The lodge will have underwater access to the pond, but the beavers are confined to the pond once it freezes over. The dams create the deep water needed for winter food storage. While other wildlife endures the cold northeast winter and hunger, beavers stay warm in their lodges with an underwater food cache nearby. A colony can exceed six beavers - parents, yearlings and kits - who peacefully coexist in the lodge during the winter months. Perhaps this is the key to their longevity throughout New England. Next time we look at that most majestic of trees, the White Oak.